If we can agree that sustainable car parking doesn’t mean getting rid of all vehicles, including electric, what then is sustainable parking? From the urban design or urban planning perspective, it seems that a shared, underground parking garage may be the closest thing to sustainable car parking. Underground parking garages have many sustainable features, so why don’t we see more of them? No contribution to heat islanding. Theoretically, underground parking garages should also provide a higher level of safety and security. More safety comes from the virtual elimination of weather-related problems and height-related risks, such as falls, that are possible with aboveground parking garages. 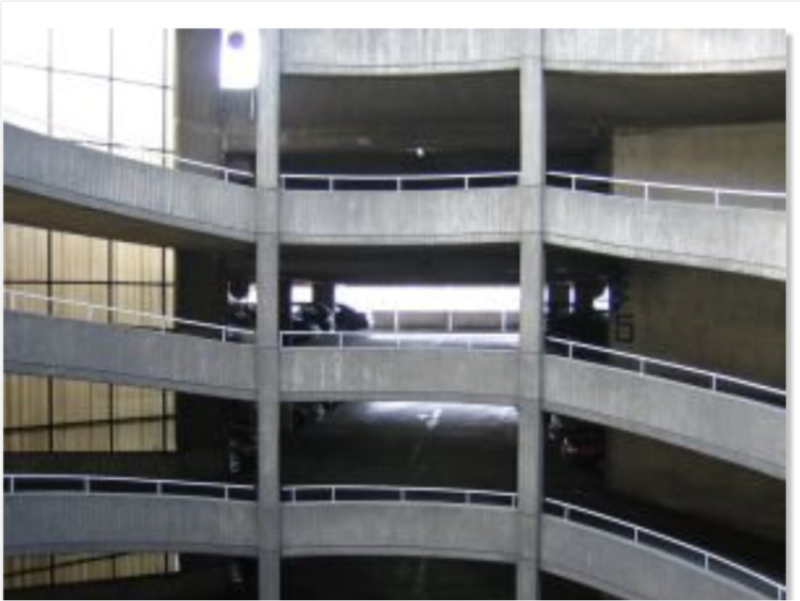 Increased security comes from the more limited access to underground parking garages compared to aboveground parking garages: there are fewer, more well-defined access points for vehicles and pedestrians. This limited access would be expected to have an inhibiting effect on criminal behavior inside the underground parking garages. With all these advantages, why aren’t there more underground parking garages? Why isn’t there a magic button that moves all aboveground car parking garages underground. One answer: Putting conventional parking garages underground is very expensive. The basic problem is that conventional parking garages need to be a certain size to be economically feasible…to achieve an appropriate economy of scale. Often, the economy of scale for underground parking garages is achieved with many fewer parking spaces than for aboveground parking garages. If, for example, an aboveground parking garage achieves the lowest cost per parking space with 250 parking spaces, an underground parking garage may achieve the lowest cost per parking space with fewer than 100 parking spaces. This inequality of economics is a major hurdle for underground parking garages. Automated parking systems (APS) redefine the concept of underground car parking in many ways. One significant way is cost. An underground APS is far less costly than an underground parking garage. Faster installation and much less excavation are some others. Contact your Skyline Parking representative to see how your urban design or planning can be more sustainable with automated parking systems…an optimal choice for sustainable car parking.